The drive to Marignier from home is pretty spectacular, avoiding the google maps promoted routes via Evian or Chamonix, instead taking in the cambered curves of the Pas de Morgins, the sheep fields on the Col de Corbier and the Portes des Soleil ski towns ski towns of Chatel, Morzine and Les Gets. The route is riddled with memories for me: ski holidays from decades gone by, lay-bys once stopped in to marvel at autumn colours in the Val d’Abondance, hairpin bends where I have watched pro cycling greats ply their trade. The ‘Mole’ appears before dropping into the town of Taninges, its grassy summit poking about above the tree line. We’ll have to go over that twice in the race. There seem to be a lot more people around than last year, over 300 starters for the main race, and I worry that my aim of sub 5 hours will no longer be good enough for a top 10. Trail running is a fast growing sport, and here is the evidence. More pressing concerns are finding a parking space, the size of the queue for race numbers, and the need to both warm up and find the nearest toilet with 15 minutes to go until the race starts. We line up, and it’s off up the road out of town. The ‘warm-up’ loop. This is the first 5km of the race, first on road and then trail, climbing more gently than the later efforts. We drop down a little, passing the spot I rolled my ankle last year, and I allow myself a smug grin that I am 100% fighting fit. The first climb is an absolute beast: 1,200m of vertical gain in just 6km. There is not a lot of running going on, except for the brief road section half-way up, so it’s poles to the ready and working out if long strides or a fast cadence is more efficient. I end up doing a bit of both. Eventually the summit comes, and a race volunteer shouts that I am in 24th place- this surprises me- at the same point last year I was significantly slower yet in 18th place, curse all those other people like me getting into the sport. I fly down the long descent, making up five places quite quickly. I can’t seem to put a foot wrong, and gracefully skip through the technical sections and glide over the many loose, rocky sections. Just as I am mentally congratulating myself for the improvements made in descending, I catch my left foot on a rock, and wipe out in dramatic fashion. Both knees smash into rocks, as do my left elbow and shoulder. I quickly get up, blood from gashes in my knees is already trashing my brilliant white compression calf-guards, and my shoulder hurts like hell. I wobble a bit, and test everything to see if it is broken, dislocated or just bruised. Two runners stop and look worried, there is a fair bit of blood, but I wave them on. I head on down, my knees hurting with each stride at first, but then the adrenaline and rhythm take over and in just a few minutes I am at the bottom of the climb. At the half-way mark in La Tour, bottles are filled, and its back up again, a full vertical kilometre. By the top I’m flagging a bit, and the start of the middle descent is initially slow and painful, however confidence and the speed it brings return, and things look up. Again, just as I’m caught thinking that things aren’t so bad and sub- 5 hours is still possible, I fall for the second time, a carbon copy of the first, but with a less rocky landing. Nevertheless, the missing skin on my left palm loses another layer at the exact same point, my right knee bleeds some more, and I release an awful lot of expletives. Runners start passing me as a once again gather myself, not too many, but enough to let morale sink a bit. As I set off again, one, and then two tiny ladies pass me, light-footed and effortless on the down. I envy their small frames and efficiency. The final climb is shorter, but we are into the midday heat now and it takes a toll. I pass a couple of people, including one of the girls, and settle into a sustainable pace. I pass a few British walkers chatting near the summit, and feel comfortable in my euro-runner disguise, surprising them with a cheery hello as I move through. The summit breathes fresh wind, but then my least favourite part of the race comes: the long drop. The descent loses 1300m in under 5km, averaging -27%. My knees are trashed, and everything hurts. I pass somebody suffering with cramp, and then get passed myself by a group of four. I play a game of leap-frog with another runner, both of us briefly stopping to rest quads alternately, but as we reach the end I pull away, knowing there is just a kilometre to go. The second place girl passes me once again with her smooth descending, and I am unable to catch her as we approach the line. I finished in 5 hours 9 minutes, a lot better than last year, but short of the goal. 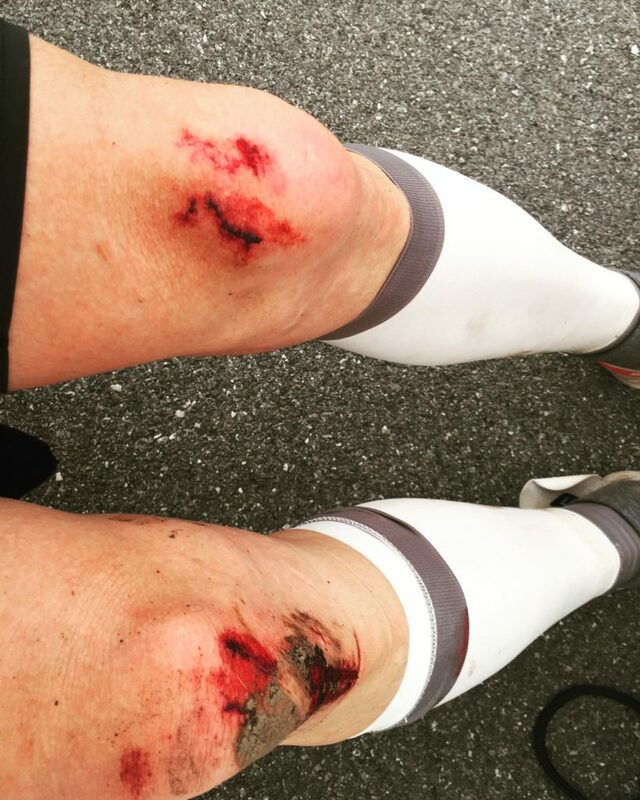 As the first aiders patch me up at the finish (for the second year in a row), I rue my lapses in concentration and over-confidence on the technical descents. Back at home, cold beer in hand and ice pack in full rotation around my body, things feel a little better: 50 minutes is a big improvement over this distance, and there is still time to lose more weight and train for the downs!